Well in case you haven’t heard, Carol is famous. That’s right, young Carol was featured in the Times Free Press a few week’s ago for offering her soup expertise, and clearly we could not be more proud. 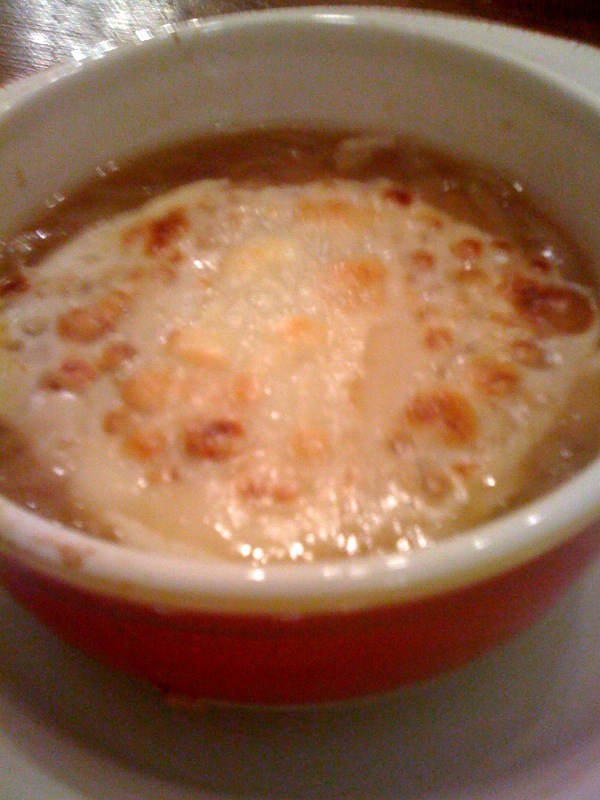 This is a recipe Carol adapted from Epicurious.com, and I can personally attest it is delish. The really fun part here is the jalapeno parsley puree. 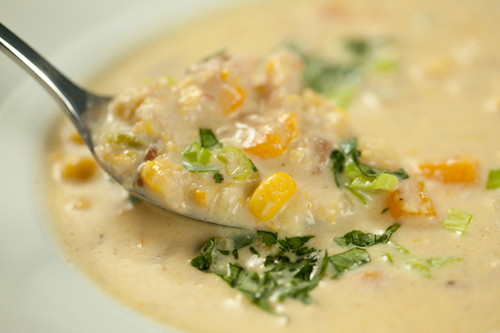 It’s bright (in taste and in the bowl) and it gives the creamy corn chowder a wonderful kick. This would be a perfect dish for a day like today in which everyone is feeling gray, wet and pretty darn depressed that the long Thanksgiving weekend is over. Except me. Because I’m about to go see Twilight. By myself. And no, I could not be happier, so don’t you cry for me, Nummy! 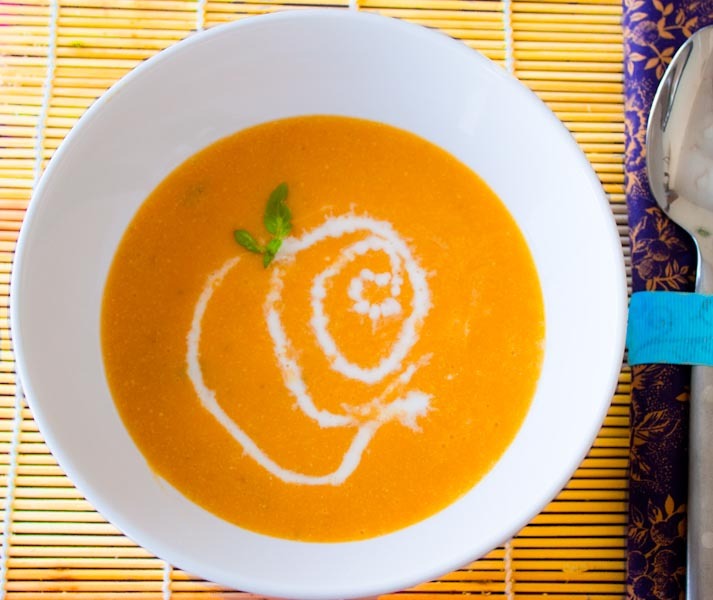 Now get your soup on. Broil the jalapeños on the rack of a broiler pan under a preheated broiler about 2 inches from the heat, turning them about every 7 minutes, for 20-30 minutes or until the skins are blistered and charred. Transfer the jalapeños to a zipper-lock bag and let them stand, covered tightly, until they are cool enough to handle. Peel the jalapeños, cut off the tops and discard all but 1 teaspoon of the seeds. In a blender, puree the jalapeños and reserved seeds with olive oil, lime juice, water, garlic, parsley and salt. 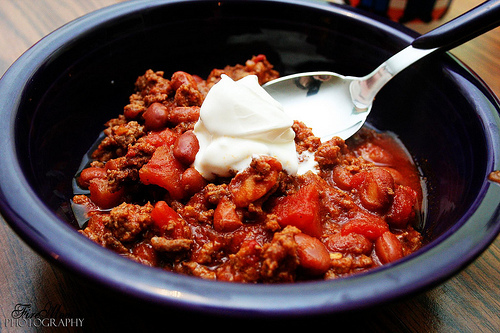 The puree may be made 3 days in advance and kept covered and chilled. Cook onion and celery in vegetable oil over moderate heat, stirring, until the celery is softened. Add broth, water and potatoes; simmer for 10 minutes. Stir in corn and thyme; simmer for 5 minutes or until the potatoes are tender. To thicken, purée in blender 2 or more cups of the chowder, depending on the consistency you prefer your soups, and return to pot. 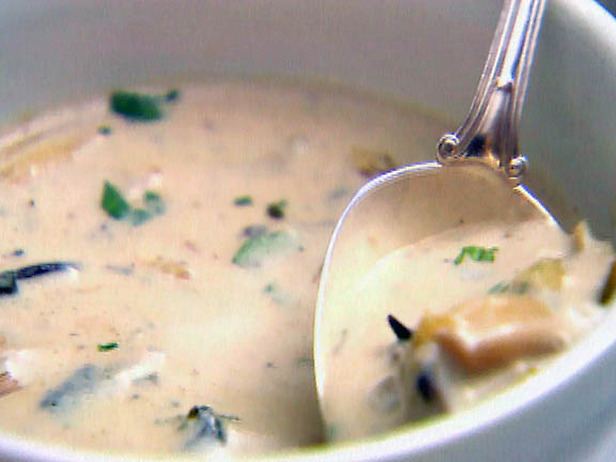 Serve the chowder with a small dollop of the jalapeño and parsley puree swirled into it. Add salt and pepper to taste as well. For added crunch, sprinkle with tortilla chips. In a rare wave of optimism, I actually thought it was not going to be cold enough again this spring for us to post this, but once again, Mother Nature has decided to play dirty. Luckily this recipe includes two of my most favorite things, so I’ve decided to look at this as a positive. I believe this is another recipe The Chef stole from JR’s private stash, and judging by the comments we’ve received on his Brandy Mustard Filets, you should probably just go ahead and make this now. On a related note, watch yo’self when you ignite the brandy in that filet recipe. One Covington resident (who shall remain nameless) almost burned down his house with that step. And I think we’d all agree that Covington law enforcement and emergency services probably have their hands full as it is. In a Dutch oven, brown beef and drain. Return to heat and add onions and peppers. Cook about 15 mintues on medium heat. Add tomatoes, beer, chili seasoning, rotel, and bay leaves. Rinse and drain kidney beans. Add right before seving. Serve with Mexican Crema, cheddar cheese, and chopped green onions. Oh, and the rest of that Red Stripe. Just for good measure. I have never tasted this one, but I love mushrooms and The Chef billed this recipe as “insane.” I’m assuming he means “insanely good” rather than Charlie Sheen insane, however I would totally enjoy it either way. BTdubs, “ragout” just means “main dish stew.” The French always manage to make things sound so complicated. Sauté shallots and garlic in hot oil in a large skillet over medium heat for 2 minutes. 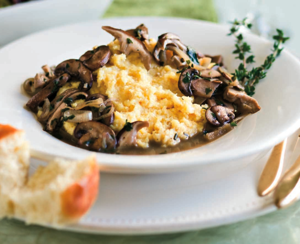 Increase heat to medium-high, add mushrooms, and cook, stirring constantly, 4 to 5 minutes. Stir in wine; cook 2 minutes. Stir in broth and next 5 ingredients. Reduce heat to low, and simmer 5 minutes or until slightly thickened. Serve over Creamy Polenta with shaved Parmesan cheese. Garnish with thyme sprigs if desired.